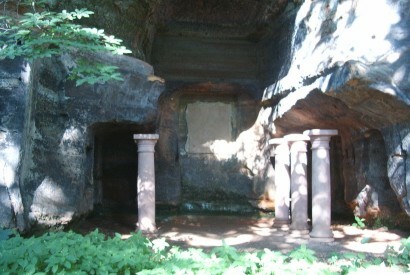 During my summer 2005 holidays in Germany, I paid a visit to the Mithraeum of Saarbrücken, or to be more correct: what is left of it. As I wrote in my article about Mithraeums, most have been smashed to bits. I didn’t have a whole lot of information about any of the Mithraums and the same was the case with Saarbrücken. This site has a few nice photos and a description of how to get there which was very helpfull. A few remarks about the route. – Then take the second street on the right (Mainzerstrasse). – Keep following this road, it is a dead end. 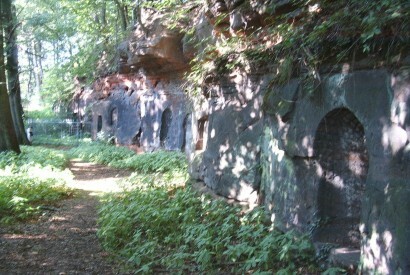 The end of the road are the gates to the Saarland radio area. There is a lot of parking space there, but you can’t use them all. About 150 metres before the barrier, there is some kind of roundabout parking lot, which is the easiest to use (and allowed). Since this is an industrial area with nothing more than a restaurant in the castle and a Mithras cave in the forest, this is not at all a touristic area. Awesome! The actual Mithraeum has got a fence around it for good reason. 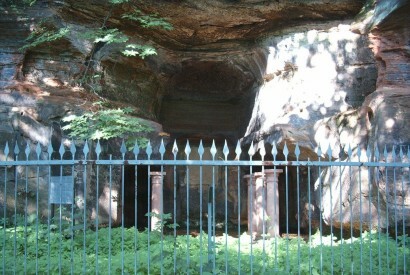 As you can see this one was built in a natural cave, but has artificial pillars. This surely makes this one one of the most beautiful Mithraeums of which remains can still be visited. Inside the fence there is a sign in German with some information. 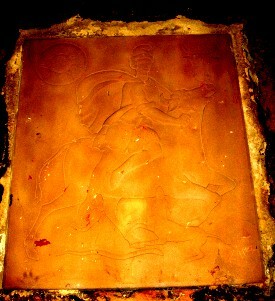 It says: “Mithras-cave or pagan chapel. In Roman times the cult of the Persian light-god Mithras was practised in this cave. 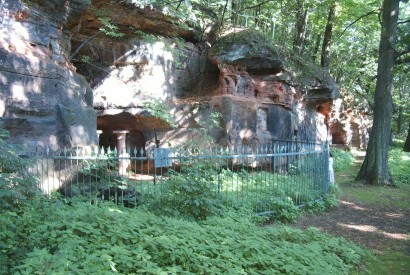 In the Middle-Ages it was used as hermitage (a pilgrimage place for hermits). Bishop Arnualdus would have preached Christianity here. Just below the arch an inscription can be seen. It is from the 19th century when the family Stumm lived on the Halberg. The text speaks of pagan priests and the legendary missionary. Which would mean something like: “In this Roman temple, long ago the gospel was preached by the ancient bishop Arnoldus in the year 598”. Below this text, there is a modern clay (I think) plate with Mithras probably made to at least make something reminding of a Mithraeum. I don’t suppose this looks anything like what used to hang there (I made extra contrast to see it better). There is a sun in the left upper corner and a bull’s-head in the right upper corner and then of course Mithras and the bull. Anyway, nice try and it gives the idea. Doesn’t this look like a statue of some sort used to be in it? First of all, this inlet isn’t deep enough for that (only about 10 cm). Secondly, the cult of Mithras didn’t use a whole lot of statues. A mithraeum always contains a depiction of Mithras killing the bull (either on a plate or as a statue), the two torchbearers (often in the same picture as Mithras) and now and then a few other figures, such as the ‘time-monster’, depictions of the life of Mithras, other (Roman) gods such as Sol or Apollo. There is no indication whatsoever that there were Mithraeums that were stuffed with statues. Still, there are dozens of these wholes in the walls, some deeper, some more shallow. My eye did fall on many holes in the wall, also on this pictures. Have railings or iron decorations been on there. 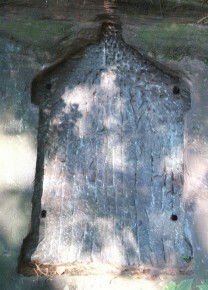 Maybe an iron case was attached to the wall with something in it, such as a statue. My guess is that if this is the case, this is more likely to have been in the ‘hermit-period’. Another reason to think that there were not a whole lot of statues in this Mithraeum, is that this was a very primitive one. It is out in the open, not hidden at all, but also some elements are missing. The two benches for the ‘audience’ probably no longer excist, but also there is no room for a ritual bath. There are a few deeper wholes behind the pillars (see left), but they are no deeper than a metre or so and not even big enough to change clothes. At first sight the ‘statue-holes’ in the walls may give the suggestion that they have been closed with bricks, but this is -I think- only whichfull thinking and after closer inspection not very likely. Besides, when there were rooms inside the cave, why would the actual temple have been out in the open? A thing that does makes me wonder: if this was only a minor Mithras temple, why would the users have gone through all the effort and costs of making these six pillars? 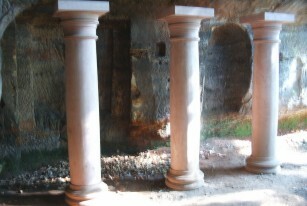 Agree, they give a breathtaking effect and make this Mithraeum one of the most beautiful, but why make these columns (that look like new), but not the ritual bath, preparation rooms or something to hide the temple a little? Maybe it hasn’t been in use very long? Maybe we just missed something. With only all this as ‘evidence’ you may even wonder if this really has been a Mithraeum, but I am sure archeologists have had their reasons to call it that. I may have to get Corpus Inscriptionum et Monumentorum Religionis Mithriacae from the library again some time to see what they actually found here. In any case, taking that here a Mithraeum used to exist and still being able to visit and investigate it, it is great to spend a day of your holidays in a place like this and since this is also not one of the better-documented Mithraeum on the internet, I hope I gave some new information to those who are looking for it.